What is the purpose of RFID? RFID allows data to be transmitted by a product containing an RFID tag microchip, which is read by an RFID reader. The data transmitted can provide identification or location info about the product, or specifics such as date of purchase or price. Author rfidchip_@2016Posted on November 30, 2017 Categories OPRFID Technologies, RFID reader, RFID TagLeave a comment on What is the purpose of RFID? 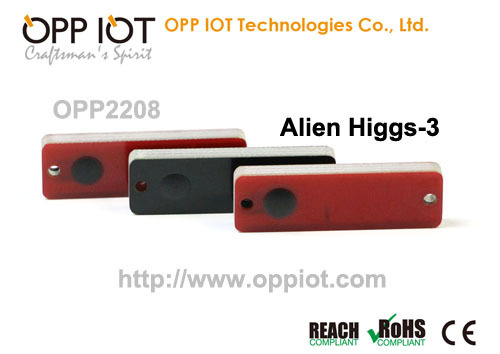 Higgs-3 is a highly integrated single chip UHF RFID Tag IC. The chip conforms to the EPCglobal Class 1 Gen 2 specifications and provides state-of-the-art performance for a broad range of UHF RFID tagging applications. 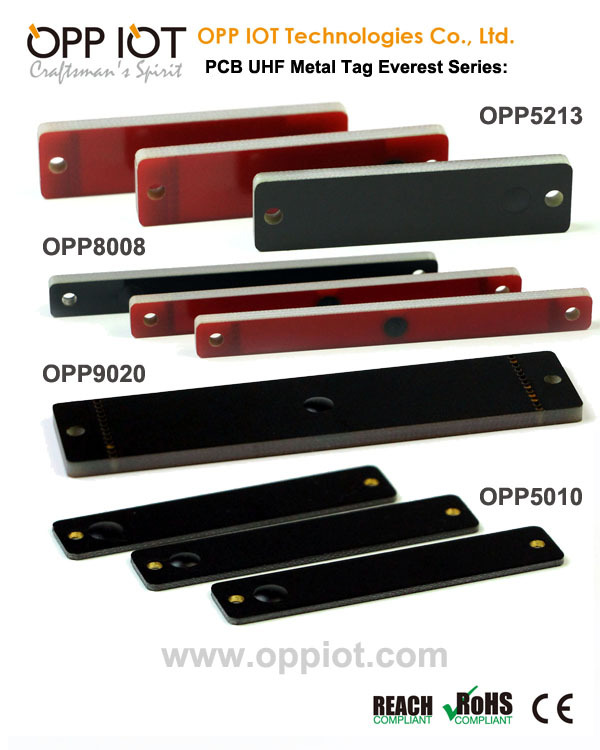 OPP IOT launched a series of high temperature UHF On-metal tags for industrial markets and health care line. The high temperature series RFID tags are specially designed as the most rugged On-metal RFID tags in the world for harsh application environment. Except featuring On-metal usage and a new anti-UV industry grade polymer casing and IP68 Ingress Protection rating for outdoor applications, it could withstand long term super high temp 150℃. The Everest series of tags are with flexible installation, such as rivets, screws fixed, or two-side glue, super glue etc. Also we recommend the brand high temperature glue to work with the tag for your harsh solutions. This series of UHF on-metal RFID tags reliability test include: high temperature and high pressure test, high and low temperature alternating test, The high level of durability improves RFID tag lifetime of up to 10 years, even for harsh industrial environments and we see an even greater return on investment. 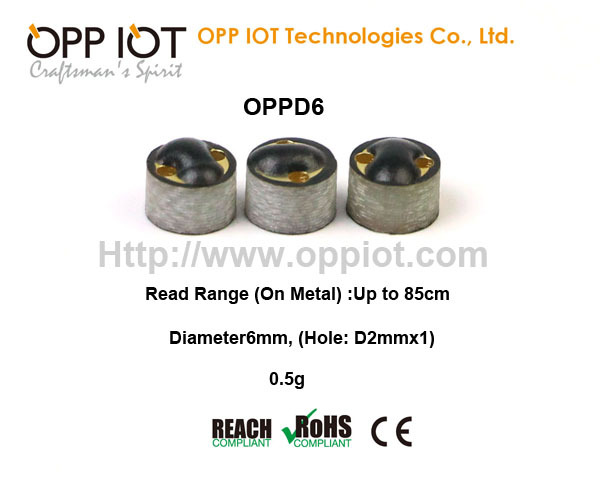 Benefit of the very small Diameter6mm (Hole: D2mmx1) ON Metal UHFTag OPPD6 is the small shape which allows to mark equipment on small area. When mounted on or near metal a coupling and booster effect can be achieved with the possibility to read the very small UHF tag from a distance up to 85 cm. The UHF EPCglobal Generation 2 standard allows the commercialized provision of mass adoption of UHF RFID technology for passive smart tags and labels. Main fields of applications are supply chain management and logistics for worldwide use with special consideration of European, US and Chinese frequencies to ensure that operating distances of several meters can be realized. The G2X is a dedicated chip for passive, intelligent tags and labels supporting the EPCglobal Class 1 Generation 2 UHF RFID standard. It is especially suited for applications where operating distances of several meters and high anti-collision rates are required. The G2X is a product out of the NXP Semiconductors UCODE product family. The entire UCODE product family offers anti-collision and collision arbitration functionality. This allows a reader to simultaneously operate multiple labels/tags within its antenna field. A UCODE G2X based label/ tag requires no external power supply. Its contact-less interface generates the power supply via the antenna circuit by propagative energy transmission from the interrogator (reader), while the system clock is generated by an on-chip oscillator. Data transmitted from interrogator to label/tag is demodulated by the interface, and it also modulates the interrogator’s electromagnetic field for data transmission from label/tag to interrogator. A label/tag can be operated without the need for line of sight or battery, as long as it is connected to a dedicated antenna for the targeted frequency range. When the label/tag is within the interrogator’s operating range, the high-speed wireless interface allows data transmission in both directions. In addition to the EPC specifications the G2X offers an integrated EAS (Electronic Article Surveillance) feature and read protection of the memory content. On top of the specification of the G2XL the G2XM offers 512-bit of user memory. Enables the UHF RFID tag to be used as EAS tag without the need for a backend data base. Activates permanent back-scatter in order to evaluate the tag-to-reader performance. 863 – 865 MHz: Used for licence-exempt wireless systems. In 2009, as part of the transition from analog to digital over-the-air broadcast of television, the spectrum from 698 MHz to 806 MHz (UHF channels 52–69) was removed from TV broadcasting, making it available for other uses. Channel 55, for instance, was sold to Qualcomm for their MediaFLO service, which is resold under various mobile telephone network brands. Some US broadcasters had been offered incentives to vacate this channel early, permitting its immediate mobile use. The FCC’s scheduled auction for this newly available spectrum was completed in March 2008. The FCC has allowed Americans to connect any device and any application to the 22 MHz of radio spectrum that people are calling the 700 MHz band. The FCC did not include a wholesale condition, which would have required the owner of the band to resell bandwidth to third parties who could then service the end user. Google argued that the wholesale requirement would have stimulated internet competition. As of 2007, 96% of the country’s broadband access was controlled by DSL and cable providers. A wholesale condition could have meant a third option for internet service. Higgs-3 operates at extremely low power levels yet still provides sufficient backscatter signal to read tags at extended range. It can also be programmed at low RF power and, in conjunction with a custom command – LoadImage – be programmed at high speed. Higgs-3 is implemented in a low cost CMOS process and uses proven and cost effective EEPROM technology. Higgs-3 offers a flexible memory architecture that provides for the optimum allocation of EPC and User memory for different use cases such as legacy part numbering systems and service history. User memory can also be read and or write locked on 64-bit boundaries, supporting a variety of of public/private usage models. The IC also features a factory programmed 64-bit serial number that cannot be altered. In conjunction with the EPC code, this provides a unique “fingerprint” for the tagged item. What RFID frequency is right for me? RFID cards and key tags come in three frequencies: low frequency, high frequency and ultra-high frequency. The main differences have to do with the reading distance between the reader and the card or key tag. When looking for cards you should start with the specification of the reader that the cards or key tags will work with. If you have the flexibility to choose a reader then you can select the card and reader frequency that is right for your environment. Author rfidchip_@2016Posted on November 18, 2017 Categories OPRFID Technologies, RFID TagLeave a comment on What RFID frequency is right for me? Speed up delivery, reduce waste, control costs and improve your customer service with Informs. Designed specifically for manufacturing, these technology solutions allow you to track materials and labor through production cycles and along supply chains for a tangible ROI and a real competitive advantage. Informs can help you reduce errors and significantly increase productivity throughout your manufacturing operations with: fully-automated, hands-free data collection; parts marking to track work-in-process and provide lifetime traceability; and real-time data capture integrated into MES, WMS, ERP or other management systems. We offer solutions for asset tracking, load management, product labeling and tracking, receiving, put away, order picking and staging, shipping, inventory management and replenishment, time and attendance, and quality assurance. Data collection and marking/labeling solutions Handle labor-intensive assembly tasks and optimize and track operations with solutions ranging from fixed-mounted computers and wireless scanners to fully automated environments with printer applicators and RFID readers. Security and access control For the latest security, Informs delivers a certified wireless installation ensuring optimum performance from your networks. We provide customers with many tools for rapid deployment, fast problem solving, and remote configuration control. Multiple form factors From a rugged PDA to a full-keyboard handheld computer with scanner and local area radio, our solutions provide manufacturers with the same capabilities they have in nonhazardous environments.